Real estate postcards are small, single-page mailers that real estate agents send to their farm area to help get leads and build name recognition. Like regular postcards, most realtor postcards are typically 5.8 inches by 4.1 inches, glossy and printed on both sides with information about the agent, specific listing and/or the neighborhood. 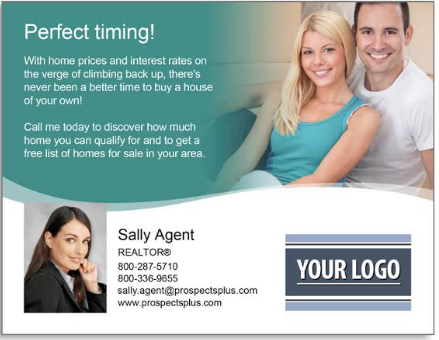 Once you find a design you like, you can create, print, and send real estate postcards fast with ProspectsPLUS! Choose from dozens of professionally designed templates or upload your own. ProspectsPLUS! will then either mail your postcards to you or to a targeted list built with their demographic search and neighborhood marketing tools within 48 hours. Click here to get started. Here are the 25 best real estate postcards and what makes them effective. While the price and details of the home, as well as the agent’s information, are on the back, what we liked about this postcard was that it does its job: Marketing the property. 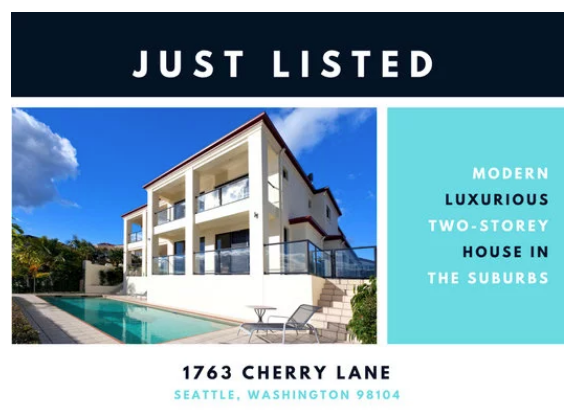 A “Just Listed” postcard should always showcase and feature the listing, not the agent. People will become engaged in the content of a new home for sale, and be more likely to throw away something seen as self-promotion. Learn more about effective real estate branding through our ultimate guide, and keep the postcards bringing in leads. 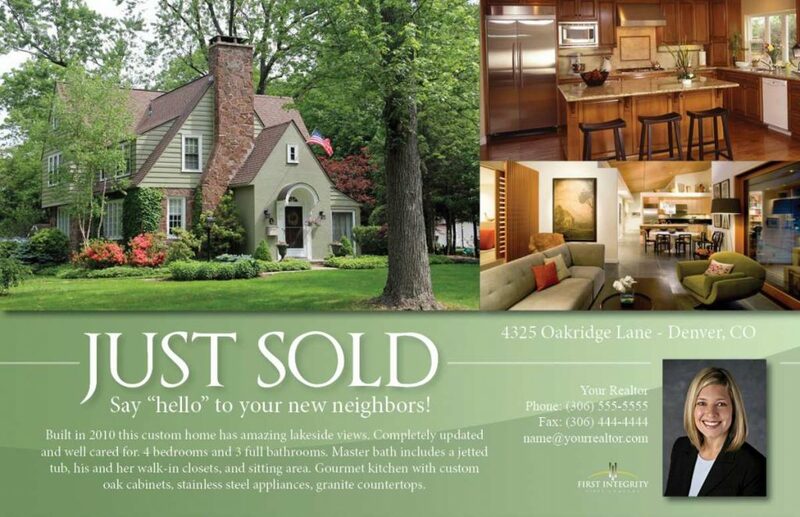 Just Sold real estate postcards will be better received with a personal feel. Notice that this well-designed card not only mentions the sale, but the new neighbors that arrive with it. People are often curious about the new people who move into their neighborhood, what the inside of their homes look like, and who they might be. Selling your services while making the sale feel personal is good strategy. For more benefits of the “Just Sold” postcard, see our article on how and when to send “Just Sold” postcards to get the best responses. Expired listings are a difficult time for homeowners, and they are often inundated with calls and solicitations. So to capture their attention, you need to stand out from the crowd. Every person is primed to pay attention to the red stop sign we see in this image, and the quick but important point is made on the front. Again, as in the “Just Listed” postcards, you want to get a message across rather than have your marketing pitch be the first thing they see. While you will include your information on the back, it’s most important that the card is read and that you make your point. If you have a lot of expired listings in your area and would like to supplement your postcards with a more personal approach, we give you five expired listing scripts that actually work to help you get more listings. What this postcard is asking the homeowner to do is unmistakable, and that is the perfect way to design your real estate postcards. 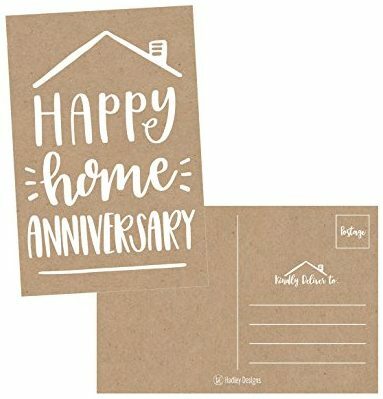 This postcard creates an inviting feel, graciously inviting the homeowner to look at the property along with clearly posting the date and address. This is the type of postcard that an interested homeowner might handily stick on the refrigerator with a magnet and enter into their calendar. 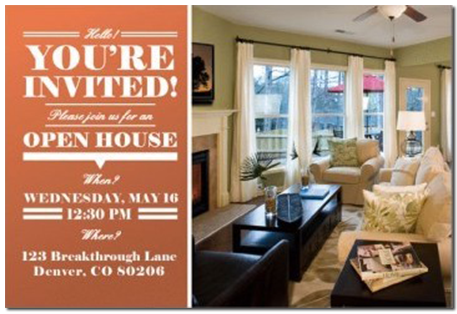 To supplement open house postcards and increase the success of your open house, feel free to tap some of our suggestions at 37 real estate open house ideas people love. The effectiveness of using realtor postcards for a new agent introduction can be a controversial topic, but making it personal seems to be the key to effective returns. The cards like those offered at ProspectsPlus (above) can be customized and help you insert more of your personality into your introduction. For agent introductions, don’t be afraid to put a little of your personality or interests into the cards. For example, feel free to include your pet or that you love historic homes (if they’re popular in the area). Inserting a bit of yourself helps people feel they connect with you, and that they aren’t simply receiving yet another solicitation. 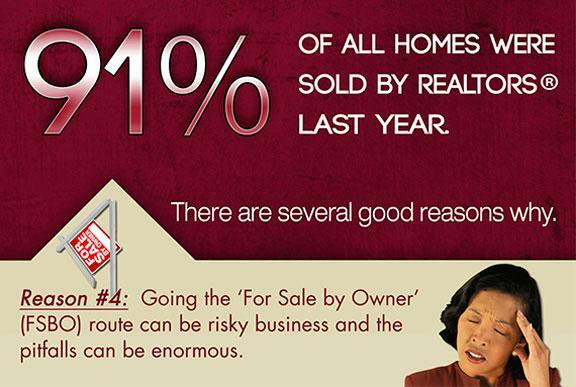 People often don’t think about selling their homes until they are reminded that it’s an asset they can leverage. While these real estate postcards can almost look generic, the value proposition that they will buy your house is directly front and center. 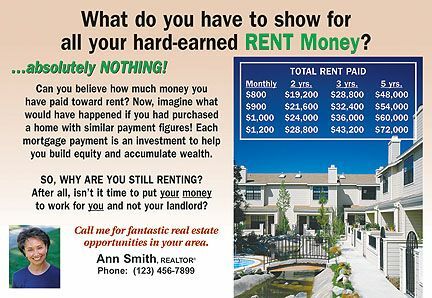 If you’re a reluctant landlord, struggling financially, or thinking about retiring sooner rather than later, a postcard like this could be the push you need to make a quick call and see what you can get. Right now, people are thinking about buying or selling a home but might need a bit of a nudge. These real estate postcards are an important part of helping buyers or sellers make a decision, so be sure to provide them with the information to do that. For example, on the card above, the agent not only nudges the homeowner but talks about bringing buyers, which would even make the prospect of selling seem far easier. If you want even more ways to reach out to sellers, see our 15 best ways to get seller leads. Buyers are always curious about the possibility of a deal, and although bank-owned properties are not quite as flush as they once were, there are still many deals to be had. By emphasizing value, your real estate postcards for bank-owned properties can get the attention of a buyer who might have been reticent. While this postcard was created by ProspectsPlus, you can feel free to add your own messages and customize for your particular farm area. If you’ve ever considered buying a bank-owned property yourself, here is our guide to walk you through the process. People are always enticed by something they can get for free, and if they’re a fence sitter, it’s often a particularly great way to gain an opportunity to speak with them. 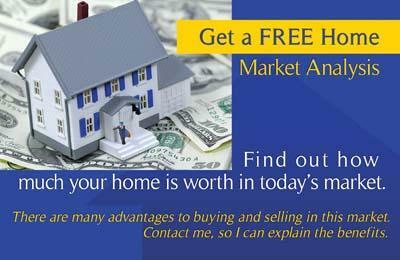 Free-offer postcards for things like home value can start a productive conversation or provide leads with individuals interested in selling down the line. Our article on fair market value and how it’s determined gives even more information on the importance for homeowners to get these estimates done correctly. These real estate postcards can work wonderfully if you simply show renters what is possible. Some of the best real estate postcards not only show renters how much they are spending but that for the same amount, they can often be paying a mortgage. People are often unaware of the numbers and how they may work in their favor, so be the person who opens their eyes a bit and gives them a different direction. 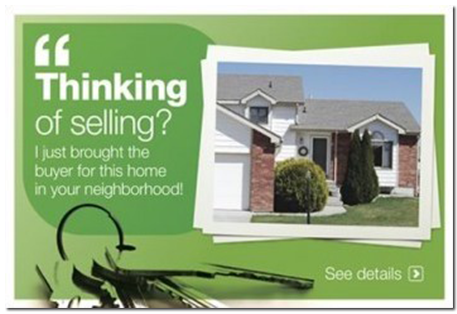 These real estate marketing postcards can be highly targeted and effective. For example, while many postcards are used in more of a “pay and spray” model (where they are distributed widely hoping to find a perfect match), these postcards can be distributed to apartment buildings where the majority of the audience likely will relate to the message. Try sending FSBO postcards a few weeks into a listing as the pain begins to set in. Despite some initial hesitation, FSBO leads are actually some of the easiest to convert. 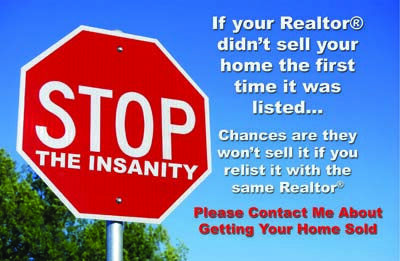 They share the same goals as most realtors: they want to sell the property quickly and get the highest possible price. While most people think they can do the job themselves, their marketing weaknesses often show themselves early as open houses are empty and the home begins to sit. For more information on converting these homeowners into clients, see our article on prospecting FSBO leads. Be the thoughtful professional, and send a quick note to those you’ve sold to in the past year when their one-year home anniversary arises. 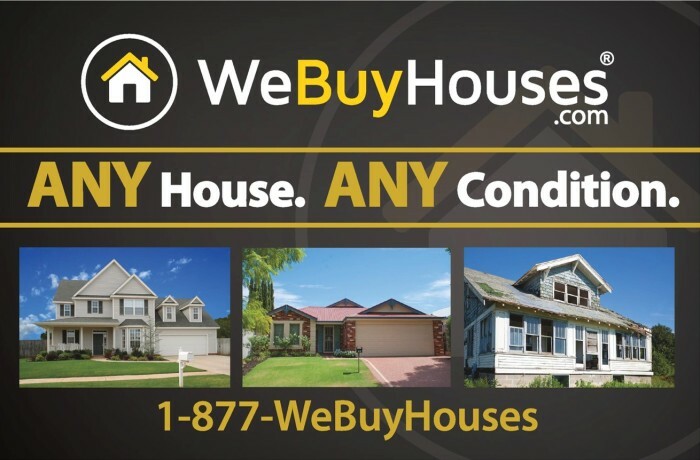 If you can remember some quirky or fun event about their homebuying process, be sure to mention it here, and stay top of mind for anyone in their network wanting to buy or sell a home in the area. If you’d like more ideas to stay top of mind with former clients, we have 31 examples of pop-by ideas that the pros use to generate leads. 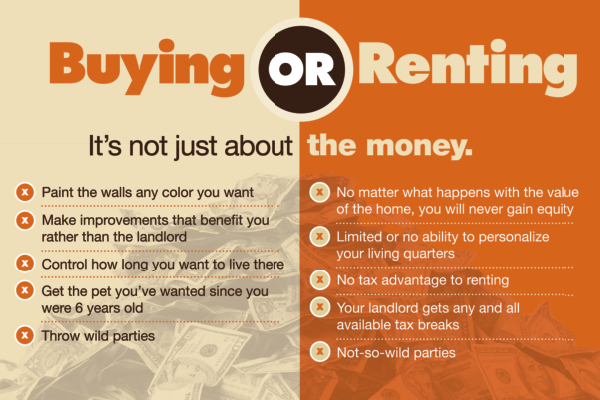 Renters are a prime population to target, and while you can take the approach of showing them the numbers (as the postcard above illustrates), you can also show them the benefits. Different people will respond to different approaches, so it’s wise to hit them with a variety of messages. While this real estate postcard shows the customization aspect of homeownership and the ability to truly make it a home, it also includes a bit of fun. 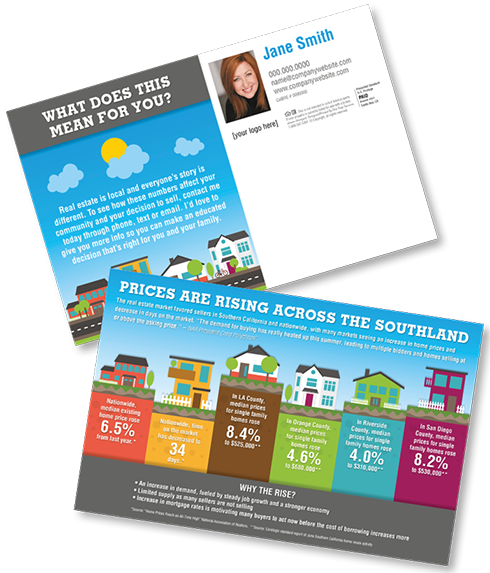 Every homeowner (and potential homeowner) is interested in local pricing information, and this is an effective strategy for real estate marketing postcards. Some potential clients will want to sell, others will be prompted to buy now before they no longer can afford to. Knowing the market status of the area also positions you as the expert and the go-to person for their real estate needs. Here’s more information on how to choose and dominate a farm area. 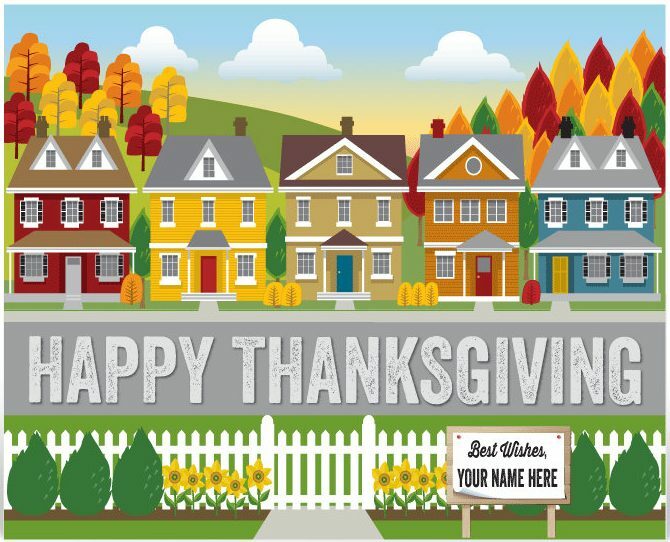 Share the spirit of the season with real estate postcards that reflect the holiday. Notice that this particular postcard showcases homes as a reminder of your business without being pushy, and allows the person to remember what you do while spreading the joy of the season. With holiday real estate postcards, it’s far better to simply be a reminder than a pitch. People love to do business with those they like and who they believe like them as well. While periodic nudges toward referrals and business is fine, it can backfire if clients feel that they are receiving constant advertisements. 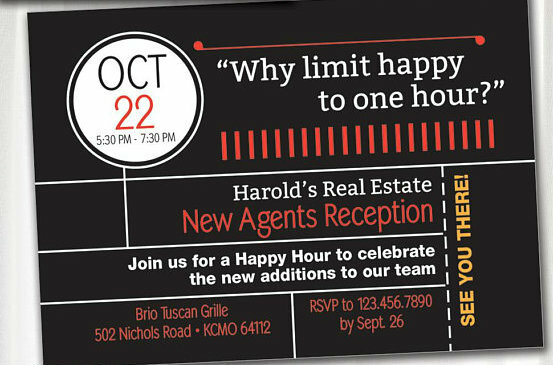 Who doesn’t love happy hour? By sending out these postcards to previous clients, or those in the neighborhood you want to meet with, it can be an event that allows people to network, see the fun side of the work you do, and get to know your team personally. While this is an idea I haven’t seen before, it was a smart one that might just draw some great contacts. If you’re a new agent or an agent who doesn’t have a place to store those contacts that gives you reminders and helps you nurture leads, we looked at the three best real estate CRMs to boost your pipeline. 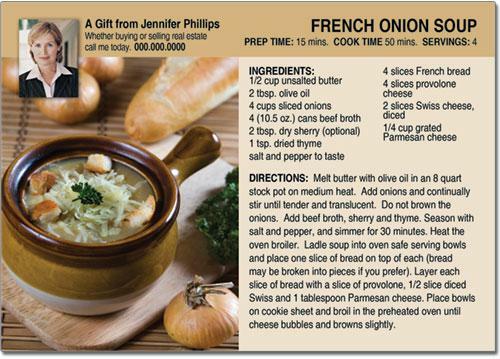 Custom recipe postcards can be a tremendous hit or a big fail, and what makes the difference is the effort you put in. Think about whether or not the recipe is seasonally appropriate, if it’s easy, if it’s something a lot of people like, and maybe give them a little exclusivity by throwing in a “family secret” recipe they can’t find elsewhere. When there are so many mailers coming in the door, people will pay attention to something special, and they’ve been primed to detect the generic for years. Make an effort, make it interesting, and have your postcard tacked on the refrigerator for the season. Many people have the dream of owning their own house, but some may not take action on it until the perfect time seems to arise. We loved that ProspectsPlus has postcards you can customize specifically for these individuals, and add your spin on the possibilities it holds. If you’d like to learn more about interest-only mortgages and other types of financing aside from traditional mortgage loans, read our guide to interest-only mortgages. Real estate postcards for short sales and foreclosures are a dime a dozen, but this one does a lot of things right. Notice that this agent helps the client see a way out, positions herself as a specialist, and doesn’t use fear in her messaging. This real estate postcard is perfectly suited for someone who is looking for a way out of a bad situation and wants someone approachable to consult. If you’ve wanted to know more about short sales, what they are and how to finance them, we have a fantastic article on buying a short sale. The wonderful thing about recent activity postcards is that they can show your expertise without having to yell “I am good at my job!” from the rooftops. If a buyer or seller is looking for an agent, showing your recent activity through these real estate postcards makes you look like an obvious front-runner for the job and someone who clearly knows what they’re doing. If someone has been kicking around the idea of moving, receiving real estate postcards like this might just inspire them to take action. In high demand areas with low inventory, receiving postcards or mailings is not uncommon, so be sure to stand out with your messaging and even your use of color. Notice yellow is used to highlight “low inventory” as well as the buyers she can bring to the table, which is a smart way to lead the eye when you have only moments to make an impression. 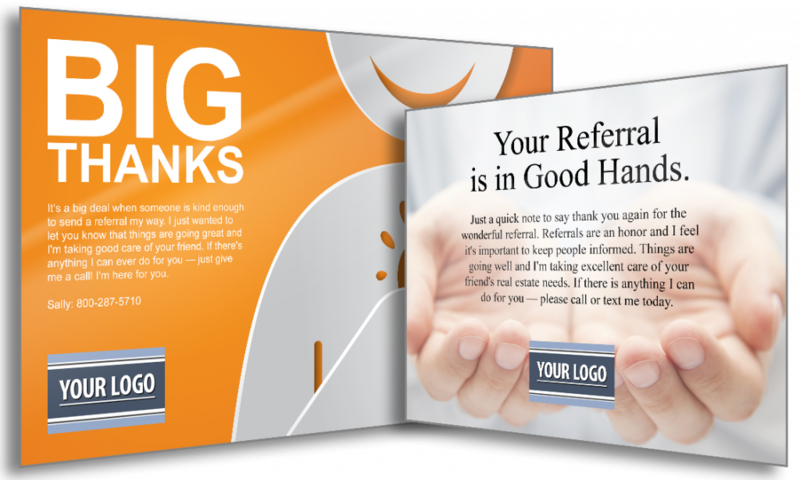 A referral is the biggest compliment a customer can offer you, so be sure to repay the favor with your acknowledgment and assurance. These real estate postcards are less about solicitation and positioned more around gratitude. ProspectsPlus does a nice job here by allowing you to customize your message, yet provide a tasteful logo that reminds customers what you do and who you are. Many people use home maintenance tips, but unique seasonal events are the types of real estate postcards people often use and keep. 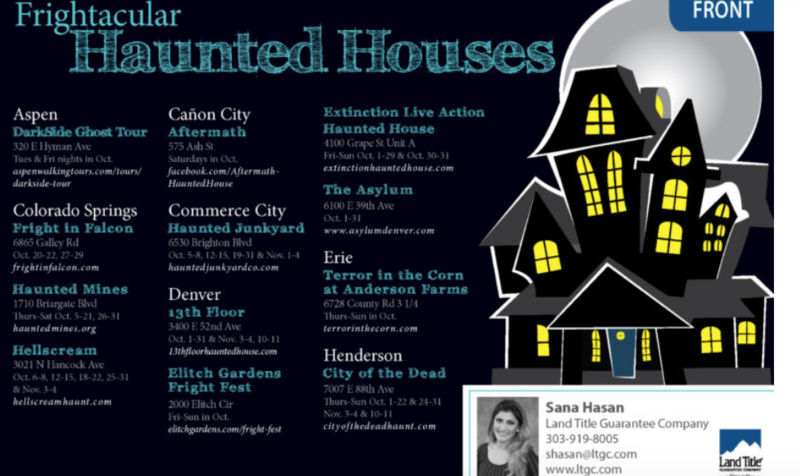 List haunted houses, local pumpkin patches, hayrides, or other events. By reminding residents of the things to do in the area, this agent not only positions herself as a neighborhood expert but also as someone you might see as enjoyable to work with. Do something out of the box that people won’t expect and have your postcard more likely to be kept and your name remembered. 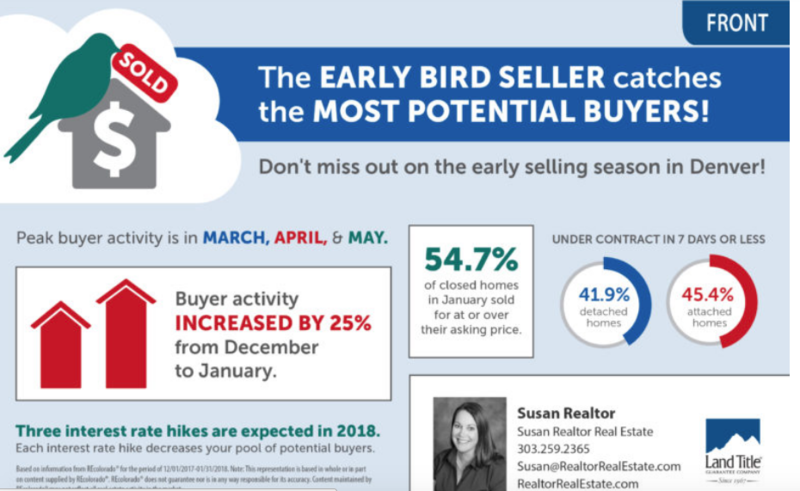 The hot season isn’t always something potential sellers think about, so this is a wonderful reminder when sent a month or so before spring begins. Knowing the potential financial upsides to listing a home sooner rather than later can certainly engage sellers to reconsider plans to list at a later date. Knowing when to sell certainly is connected with what we know about when to buy. We looked at publicly available national housing data from sources like the Federal Reserve, Census Bureau, and Zillow to show you the best and worst times to buy a home. Postcards may seem old-fashioned, but if you position yourself to connect across platforms by encouraging recipients to check out your social media profiles, you could capture both offline and online audiences. 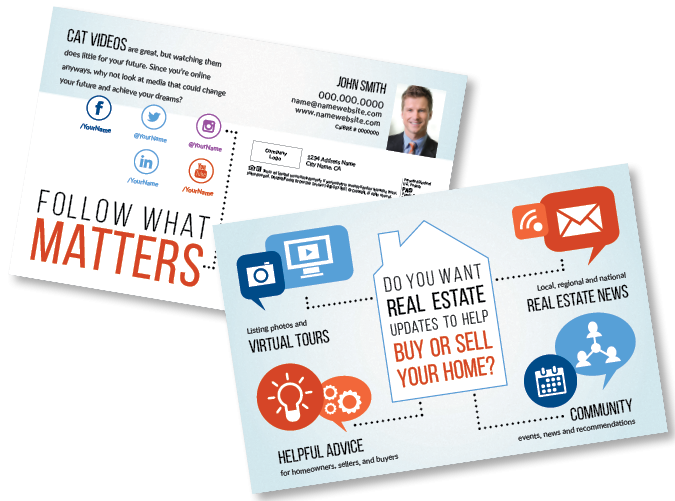 Driving to social media with your real estate postcards gives you the opportunity to share different components of yourself (and your marketing) with audiences that may not be as responsive to traditional mailings. If you’re still on the fence with how to use some of the social media platforms available, we put together an article explaining Facebook for Realtors that will help you get started. Real estate postcards are a strategy that has been used by successful agents for decades. More than any other marketing technique, real estate postcards allow you to target local areas with pinpoint accuracy and show your leads you’re a market expert. There are many benefits to real estate postcards. Real estate postcards plant a seed. Don’t expect to receive a huge amount of traffic after your initial round of postcard mailing. Instead, consider it as an investment in your future. Postcards help you get a few leads in the short-term and build brand awareness long-term. Once you start getting leads from your postcard mailings, you want to make sure you have a simple system in place for nurturing them. In addition to storing all the information you need about your leads, Pipedrive CRM can automatically send them a personalized email whenever they are entered or reach a certain stage in your pipeline. That lets you keep your leads warm while you focus on other high-priority tasks. Click here for a free trial. 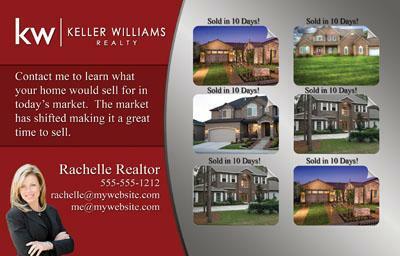 Real estate postcards can target only the people who will most likely respond to your call to action. Think of sending postcards as circle prospecting without the phone. The people who live in the neighborhood of your just listed or just sold house are the ones most likely to be curious about it. 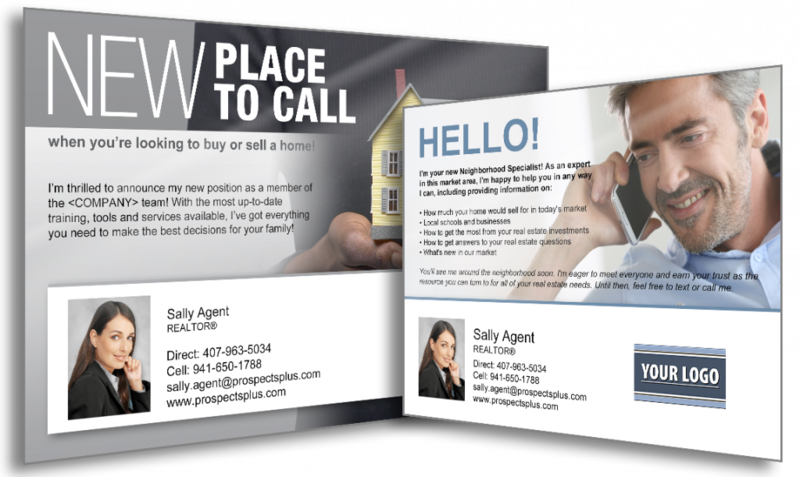 The average price to design, print, and mail small batches of real estate postcards is less than $1 per card. For larger batches, you can get that number down below 50 cents per card or less. If you want something that will get your name or homes in front of those in your farm area for very little cost, real estate postcards are a great way to go. 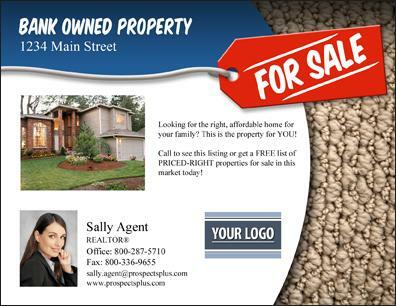 When you send real estate postcards with current listings, it communicates an important message to your audience. 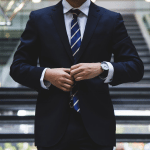 It conveys the message that all of your clients are treated to an aggressive marketing campaign so, for example, a seller may feel more confident in choosing to work with you. Postcards are the epitome of a brief punch message. Most people have very little patience for direct mail, and you have only a second or two of their attention before they decide to throw it in the trash or keep it. With a well-crafted message, you can get potential customers to read or keep your postcards. When people get a marketing message, they are generally only asking themselves one simple question: What’s in it for me? While this seems like an overly simplified concept, in reality, it should be central to everything you do in sales. If you’re only focusing on what’s in it for you, chances are your marketing will fail. This article is a great example of this concept. You saw the headline, clicked on it, read the first few paragraphs, and now you’re reading this one. Why? What’s in it for you? Maybe you’re trying to kill time between appointments or are getting ready to launch a postcard campaign next week and need advice. You’re here for a reason. If you can figure out your audience’s reason to read your postcard, you can capitalize on that and see great returns from your postcard campaign. Here are a few reasons an audience might read and keep your postcard. This one should be obvious. 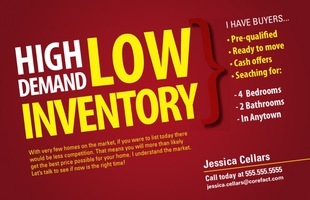 If they’re selling or buying soon, they may be actively looking for an agent or are very interested in local sales. If there’s one thing people love to do, it’s offer (usually unsolicited) advice to their friends. If your message is compelling enough, they may pass on your information. The offer is the king of answering “what’s in it for me.” There are endless things you can offer your audience to capture their attention or have them keep your cards. While the price is right, I personally wouldn’t focus my offer on a free CMA. First of all, every real estate agent for a hundred miles around has probably offered them one already. Secondly, with a little digging, they could probably find most of this information out for themselves online. A big part of the reason homeowners are reluctant to sign with an agent is long sales contracts. Offering a one- or two-week contract with contingencies is a genuine value for homeowners that may make them pay attention to your card. Offering a guarantee is a tangible value for your audience and a great reason to keep your card. A common phrasing of sales guarantees is to offer a cash reward if you can’t sell their home in 60 days. If you have a good relationship with a local business, see if you can work out a deal to offer your audience a discount. For example, if you are friendly with a contractor or handyman, you can offer a discount on their services. You get to offer value to your audience, and in turn, the handyman gets free advertising and perhaps a bit more business. If designed and printed nicely, local calendars can also be worthy of posting on their refrigerator. You can offer high/low tide schedules if in a boating or beach area, sports teams schedules for local fans, or even locations and dates for holiday events in the area. Never underestimate the curiosity of nosy neighbors. They may not be selling or buying today or even this year, but they still want to know what houses are selling for because it affects their home’s value. Maybe the house you’re featuring on your postcard belongs to a friend or acquaintance of the person who sees the card. Whether you’re thinking about what you want to say on your postcards, which listings to feature, or mulling over your layout, you need to keep one image in your mind: a person standing over a recycling bin sorting their mail. Remember KISS, and Keep It Simple, Silly. Since you have so little time, you need to make your postcards as simple and easy to read as possible. If they can’t decide what’s in it for them in a second or less, it’s likely going in the bin. How Much Do Real Estate Postcards Cost? For the traditional postcard (4 inches x 6 inches), the average cost of mailing ranges between 23 cents and 41 cents per postcard with a mailing service. If you use EDDM (Every Door Direct Mail) through the post office, expect to pay around 18 cents per unit. If you’ve ever done an internet search for postcard mailing companies, you know there’s a lot to choose from, and the prices vary a lot. It’s important to go with an established company that may seem more expensive upfront but won’t hit you with hidden fees. For the sake of simplicity, ProspectsPLUS is an excellent option to consider. ProspectsPlus offers two mailing services: first-class mailing or standard (bulk) mailing. Choose first class mailing for time-sensitive material, because this option is quicker. Your postcards will be delivered within three to five days. With ProspectsPLUS, the price per first-class mailing of a 4×6 postcard is .59¢ or less; for larger postcards, the price can go up to .89¢ per piece. Choose standard (bulk) mailing to save some pennies. It’s more cost-effective but definitely slower. The average delivery is between 10 and 14 days, so it’s not good for event notification. Expect to pay .70¢ to .80¢ with a 200-card minimum. The rates decrease as the quantity increases. ProspectsPLUS only offers standard mailing for jumbo (8.5-inch by 5.5-inch) postcards and larger. What’s included in a mailing service? Let’s keep ProspectsPLUS as an example. Combining lists—up to three lists can be combined and processed at no additional charge. Each list after the third will incur a fee of $15 per list. If you choose to send it yourself through the USPS, expect it to vary between .25¢ and .34¢ per postcard. The price ranges on whether you’re sending it to a wider distribution. Below is the cost breakdown for mailing real estate postcards without a mailing company. In order to get a first-class commercial rate, you must send at least 500 cards. Otherwise, the charge is .34¢ each. When you send 500 cards, you have the option to send to a 5-digit zip code at .25¢ for 500-plus postcards. If you’d prefer to cast a wider net and send to a 3-digit zip code area, expect to pay .26¢ for 500-plus postcards. For presorted postcards, the postcard rate goes up to .29¢ each for a minimum of 500 postcards. Be aware that USPS charges an annual mailing fee that hovers around $215. You’ll also need to apply for a mailing permit, but it’s free of charge. Mailing without a mailing service can be a lot to take in, which is why it’s often easier to just go with a service to save yourself time and hassle. Often, printing costs are very reasonable, less than the cost of mail. Although the price can vary widely depending on the volume and the company you choose, expect to pay a price between .05¢ and .17¢ per postcard. When it comes to design, you have three choices: design your own postcard, use a template, or hire a design team. Charges range from $0, if you do it yourself or choose a free template, to $99 and up for a design team. Templates are often a popular option because the design elements are set and there are no surprises. You just submit your own images, message, and contact information. It’s easy to do and probably the quickest option. Instead of buying templates, another option for great design on a budget is to use Fiverr or 99designs. Both services let you hire great designers for very affordable rates. On Fiverr, you can hire someone to design a custom postcard for as little as $5, and on 99designs you set up guidelines and several designers come up with mock-ups for your design. Once they’re all in, you can choose the one you like best. Building an effective mailing list can happen a number of ways. While you can procure your own mailing list through your existing clients, if you’re launching a big campaign, you may not have enough people on your list. Services that specialize in building a mailing list can help increase your exposure. There are companies that specialize in list building that help make your job easier. For example, ProspectsPLUS enables you to build a list based on geography (zip codes or neighborhoods), demographic characteristics (number and age of kids, estimated home value), and even behavioral attributes like how recently they last moved. For the lists that ProspectsPLUS provides, expect to pay between .03¢ and .20¢ per record, depending on the quantity order. This price is fairly typical but will reduce by volume. The more records you buy, the less it will cost per record. Click here to get started. EDDM is a service offered by the USPS that lets you send a postcard to every single home along a particular mail route for a little less than 18 cents per postcard. That means to reach 500 homes in your farm area, you’ll pay a little less than $100. This is a great option for new agents to target specific neighborhoods they want to build their sphere in. 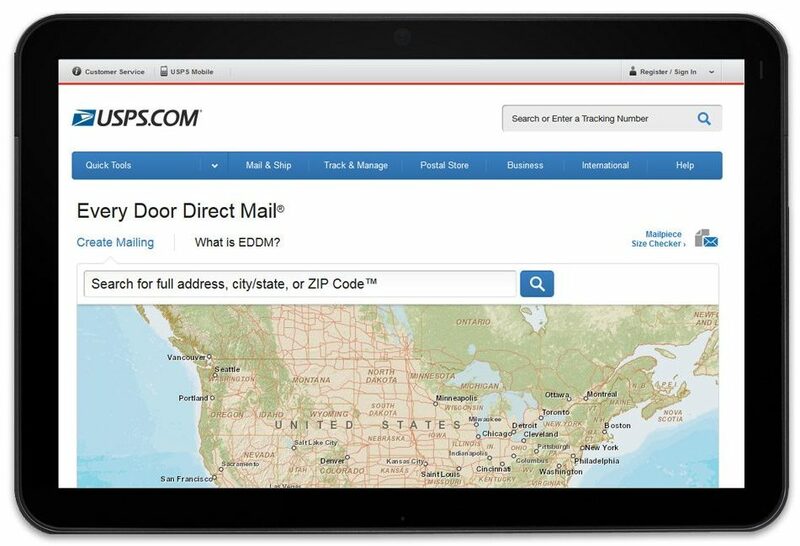 Considering it’s run by the United States Postal Service, EDDM is actually pretty simple. All you need to do is design your postcard according to their guidelines, and have your direct mail company send them via EDDM or set up EDDM yourself via the USPS website or at your local post office. The USPS will then deliver your postcard to every single home on the mail route you select, up to 5,000 postcards per day. According to most studies, direct mail has a response rate of around three percent to four percent. That means that out of the 1,000 postcards you sent via EDDM, you should get around 40 responses. If you can get a listing or buyer client from just one of those responses, you’d have an ROI of over 1,000 percent. If you’re pressed for time, you can also have a printing company like ProspectsPLUS!® handle the EDDM setup for you. They charge a setup fee of $20 per carrier route as well as standard printing and EDDM postage rates. The only caveat is that they only offer this service for “Panoramic”-sized postcards (11 inches by 5.5 inches) and up. How Do You Design a Real Estate Postcard? In designing your real estate postcards, you want to focus on utility rather than aesthetics. That means making sure your design is readable, clean, and interesting enough that your audience will want to pick it up and read it. Deciding on specific elements like design, paper type, and size will be important. Remember that because you have multiple mailing campaigns, you want your unique style to both stand out and be recognizable. You should at least have five rounds of mailings. Be sure when you are designing to keep a similar look to your previous efforts so that they all look like they belong in the same family. Use the same photo of yourself. Place the logo in the same spot. Use the same colors and layout. All of these factor into brand recognition. UV coated is often the most popular choice because of its glossy, high-end look. If gloss isn’t your thing, you can also use a professional matte finish for your postcards. How Often Should You Send Real Estate Postcards? When you take into account that most business owners feel dejected and end their postcard marketing campaign after the third round, you can see why a lot of people don’t end up seeing the value. However, when you continuously send postcards to a target demographic, something magical happens and you’ll start to see a bigger response after the fifth contact. Sometimes it can be challenging to determine the effectiveness of your postcard marketing campaign. Unlike websites and Facebook ads, there is no way to measure metrics in an easy-to-look-at dashboard or analytics feedback. Here are a few ways to determine the effectiveness of your postcard marketing campaign. Whenever a lead contacts you, ask them how they found out about you and be sure to do some tracking. 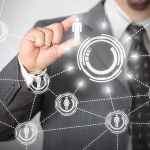 Mark the source in your CRM (customer relationship management) system, and note when they respond and what business resulted from the interaction. Over time and with consistency, you’ll be able to measure the results of your postcard marketing, though certainly, this method will not be immediate. On your postcard, give the client an incentive if they return to your office with the card. Unique offers include special discounts on your services or even free coffee. Whatever you think would entice the lead to contact you. Once they return with postcard in hand, be sure to record it in your CRM system. Set up a quick landing page and you can measure how many people who looked at your postcard then visited your website. By using a unique URL address to the specific landing page, you’ll know how many visits came from postcards. A QR code that links to a unique landing page is another way to measure who visited your website after getting one of your postcards. Although this can be a great tool for tracking, a definite drawback using a QR code is that they take up valuable real estate on your postcard. Sending real estate postcards allow you to gain leads and target your farm area in ways that speak to specific potential customers. If you mail them to the right people, keep your message targeted and offer value, a real estate postcard campaign can have a huge impact in your bottom line. If you don’t yet have a way to keep track of your leads, check out Pipedrive CRM. It lets you capture all of the information about your leads you want and automatically follows up with them and sends you reminders when they move to the next stage of your pipeline. Click here for a free trial. much obliged to you for an incredible article. my next trouble is how to make a card that emerges? I am an exceptionally imaginative individual and need to have cards one of a kind unto me. I am surprised prospectsplus is not on this list. We have been using them for years and they are the only company that offers direct mail and postcard marketing solutions for Real Estates. Thanks for the heads up, we’ll put prospectplus on our list to check out for the next update. Right now we are not planning on doing any videos on this article. But, if we decide to in the future, we will let you know! I’m the owner of MailPrism. Our service allows you to send postcards from your existing email account. It’s a less-expensive and more convenient way to send-out postcards. You simply compose an email, attach a photo for the front of the card, enter the text in the body of the email for the back of the card, and put the “to” address in the subject field. We also support the sending to a list of recipients at once. In addition to postcards, you can use MailPrism to send letters, and send/receive FAXes, SMS, and voice messages. We’re working on adding more message types too. The service is $7 per month and includes 120 credits per month and your own personal phone number for receiving FAXes and other messages. Postcards cost 60 credits each and additional credits are only a penny each. So your first two postcards each month are covered by the monthly fee, and additional postcards cost 60 cents each; this includes the printing and the mailing. Even if you use MailPrism only for postcards, it’s very worthwhile, but the added support for FAX, letter, and SMS support makes this a really great tool for realtors and other small business professionals. Thanks for stopping by and letting us know about your service. We will keep it in mind as a possible piece of future articles on postcards. I’m located in Arlington, TX. I’m looking for affordable postcard companies in my area. Do you have any suggestions? Please help. Please contact me via email. Thanks! Thanks for reading and for the comment. We do not know any postcard companies in the arlington area however Vistaprint will deliver anywhere in the US. Have you checked them out yet?